This picture is of Mary Martha Hallmark married Charles Noah Shook (who died in the Civil War) on Febuary 7, 1860 in Jay Center, MS. Mary Martha was born November 1842, Tishomingo, MS and died after 1910, MS. She was the mother of Sarah Adline Shook who married John Decabb Cox. The other lady was John Decabb Cox’s grandmother, Hepsey Beanna Thorn who married Pleasant G. Aflred Cox. Hepsey was born March 20, 1820 in Franklin County, AL and died February 27, 1906 in Booneville, MS. Hepsey raised her grandson, John Decabb Cox, and lived the last years of her life with him in Booneville, MS.
Mary Martha Hallmark is my 3rd great grandmother and Hepsey is my 4th great grandmother. 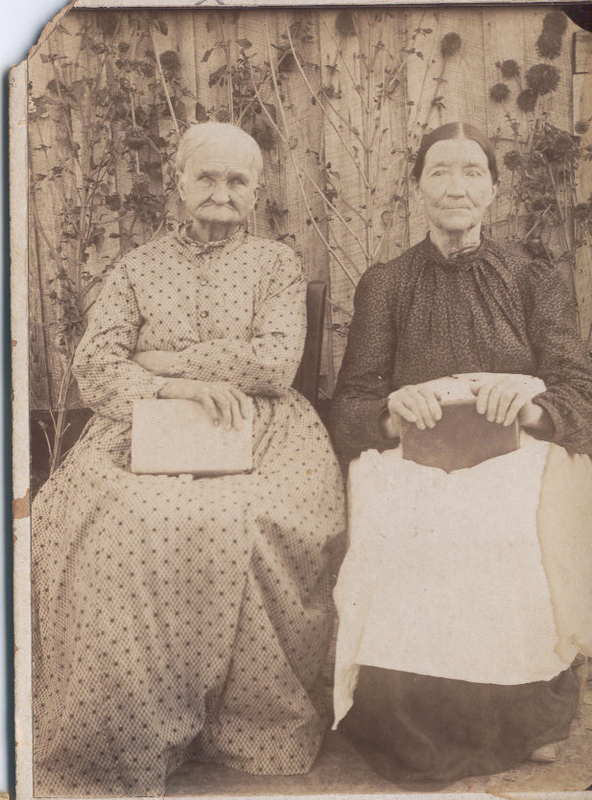 It makes me happy to think these ladies were friends as their husbands were not in their life at a young age: Noah died in the Civil War and Pleasant left to Arkanasas with his older sons for reasons not to be proven yet. Entry filed under: genealogy, gtownma. Tags: family, Hepsey Beanna Thorn Cox, Mary Martha Hallmark Shook. I am related to Hepsey Beanna Thorn. My family is from Franklin County, AL. I enjoyed the picture and the brief story. I was woundering if you had any more pictures and/or stories on the Thorn’s that you could share with me. The facial expressions are priceless and I love the unusual names. Great photo…..thanks for sharing Tina. Can you determine what they are holding in their laps? What stories they could have told us. I blew this picture up and it looks like Hepsey (on left) has a bruise little finger. I can’t tell if they are holding their purses or a book in their laps. Which one was Mary was she the dark haired lady and who was her father and did anyone hear of James Hallmark and Eliza Jones? And did they have Native american Bloodlines? Mary Martha Hallmark Shook was my GreatGreatGreatGreat (Maternal)Grandmother. If you have anymore pictures,I would love to have copies of them. I am Latricia Ann Swift, my mother (Brenda Latricia Allen Swift) My Grand Mother ( Ruby Lorene Smith Allen Heggie) My Great Grandmother (Lucretia Virginia Murphy Smith) Great Great Grand Mother (Martha Jane Cox Murphy) Great Great Great Grand Mother (Sarah Adeline Shook Cox) Great Great Great Great Grand Mother was (Mary Martha Hallmark Shook) Great Great Great Great Great Grand Mother (Martha “Patsy” Byram Hallmark).I would love to talk with you. My email is pushandpull10@yahoo.com.